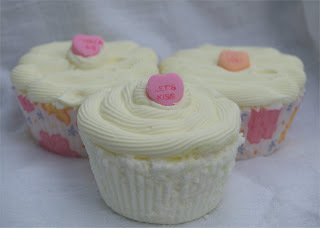 Ding, Ding… Round 2 of making bath bomb cupcakes. My first batch was okay, just issues with the frosting and I was not going to let it get the best of me (nope, no way). Dh was going to be home late due to a meeting in Charlotte so this was a great time to make them. So….late Friday afternoon, I pulled out my bath bomb ingredients, rolled up my sleeves and cleaned off the counter top. Measured out everything, re-read the directions, fed the kiddos (natives must be satisfied) and began. Poured in the baking soda, SLS, corn starch and mixed with the whisk. Mixed my fragrance, sweet almond oil, and colorant by shaking them up, then added it to the dry ingredients. Now, at some point while I am combining the wet and dry mixtures, I hear Spencer telling me that dh is home. No phone call to say he left early, sure enough in he walks full of goodies from his convention. Alrighty, say hello and must get back to work. So, everything is mixed in the bowl and I begin to press the new mixture into the cupcake liners. The measuring cup holding the citric acid is sitting on the counter and it is still full! In all the commotion I forgot to mix it in once I added the dry ingredients. I’m telling you there is always something afoot when I am working with bath & body products. 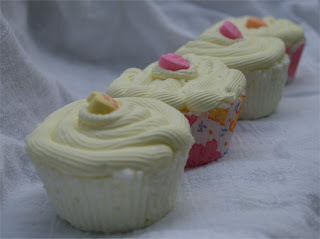 I pull out all the cupcake liners and dump those nicely formed bombs back into the bowl and mix in the citric acid. Pull out more liners, begin to fill them and double to check to make sure all ingredients are used. On to the icing, which mixed together like a dream, added a smidge more water and shazam! it was time to ice those bath bombs. We have a bunch of those left over candy hearts so I put them to good use. I scented the bath bombs with pineapple from Aroma Haven. Mmm….. a yummy, sweet pineapple fragrance. The boys are happy to have a fizzy, foamy bomb to use in their baths. I am tickled pink that they came out just right!